Interatrial septal aneurysm (IASA) along with atrial septal defect and patent foramen ovale are congenital anomalies which are encountered often in the adult patient. With improvement in two dimensional echocardiography and the increasing usage of transesophageal echocardiography, IASA is no longer considered a rare clinical entity. Early detection may prevent hemodynamic and thromboembolic sequelae. A 41-year old male patient was referred to our institution by his primary care physician for transthoracic echocardiography to evaluate his hypertensive heart disease. 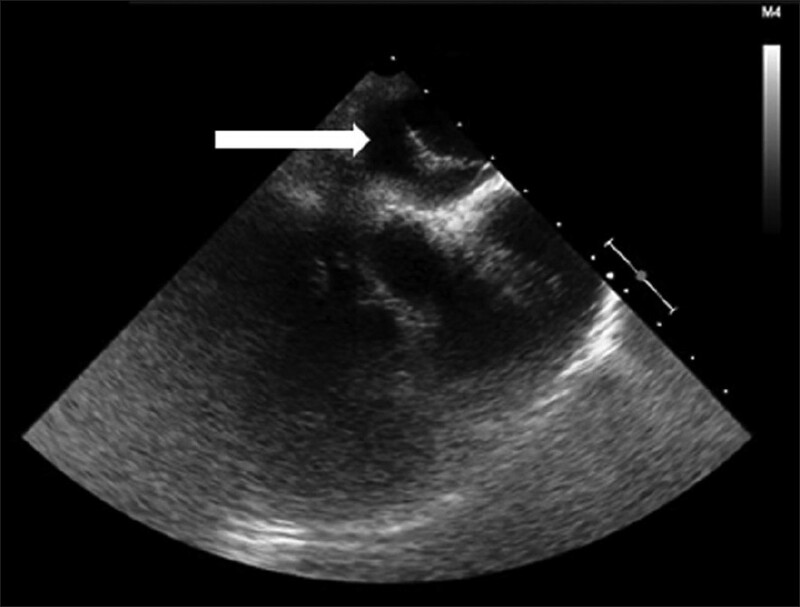 The transthoracic echocardiography (TTE) showed a large mass measuring 1.4 × 1.4 cm in the left atrium that could represent a thrombus or myxoma [Figure 1]. The patient was asymptomatic and his past medical history was unremarkable except for hypertension. Clinical and laboratory examinations demonstrated no abnormality. Computed tomographic (CT) scan of the chest and heart with intravenous contrast did not show any cardiac tumor. TEE was then done and it showed a giant IASA bulging into the left atrium and mimicking a left atrial mass [Figure 2]. The patient had not had stroke or other cardio embolic phenomenon; therefore no further interventions were undertaken other than starting aspirin. IASA is a congenital malformation of the atrial septum that may occur as an isolated abnormality or in association with various cardiac defects, such as patent foramen ovale (PFO), atrial septal defect (ASD), and mitral valve prolapse or connective tissue diseases. , Its prevalence varies depending on the diagnostic method used but with the widespread use of echocardiography, IASA has become an increasingly recognized entity. Rusznak, et al.,  concluded that IASA is detected in 8% of the patients who undergo TEE; it is associated with PFO in 25% of cases and with ASD in 22.5% of cases. The diagnosis of IASA is very important to prevent various complications and in differentiating it from an intracardiac mass-like myxoma which will have implications on choice of therapy. Nongated chest CT may be unable to distinguish ASA from intracardiac mass like in our case and in such cases, TEE should provide clarification. However, when echocardiographic evaluation is suboptimal, ECG-gated cardiac MRI and ECG-gated cardiac 64-multidetector CT scan are useful alternative modalities of diagnosis. TEE has to be regarded the imaging modality of choice for initial evaluation of this lesion as various studies have shown that a significant number of patients with IASA detected on TEE were not diagnosed on TTE. , Also as in our case TEE can help distinguishing IASA from an atrial mass, which may not be feasible on TTE images. Although IASA are usually found incidentally as in our case, they can have clinical consequences, such as cardiac thrombo-embolic events,  right to left shunt across a PFO or ASD, or can mimic a left or right atrial tumor. An annual stroke rate of 3.8% among patients with IASA and PFO compared with 1.05% among those without these anomalies was found in a systematic review of patients with cryptogenic stroke. This study implied a possible increased risk of recurrent stroke in patients with ASA and PFO. 1. Akdemir R, Duran S, Bulur S, Kaya A, Sozen SB, Bilir C, et al. A closed interatrial septal aneurysm mimicking a tumor in the left atrium. Tex Heart Inst J 2006;33:410-1. 2. Malaterre H, Cohen F, Kallee K, Deharo JC, Djiane P. Giant interatrial septal aneurysm mimicking a right atrial tumor. Int J Card Imaging 1998;14:163-6. 3. Rusznak M, Hadhazy C, Szucs M, Fazekas L, Balogh G, Szilági A, et al. Incidence of septal aneurysm and its clinical significance. Orv Hetil 1998;139:681-4. 4. Dodd JD, Aquino SL, Holmvang G, Cury RC, Hoffmann U, Brady TJ, et al. Cardiac septal aneurysm mimicking pseudomass: Appearance on ECG-gated cardiac MRI and MDCT. AJR Am J Roentgenol 2007;188:W550-3. 5. Schneider B, Hofmann T, Meinertz T, Hanrath P. Diagnostic value of transesophageal echocardiography in atrial septal aneurysm. Int J Card Imaging 1992;8:143-52. 6. Mügge A, Daniel WG, Angermann C, Spes C, Khandheria BK, Kronzon I, et al. Atrial septal aneurysm in adult patients. 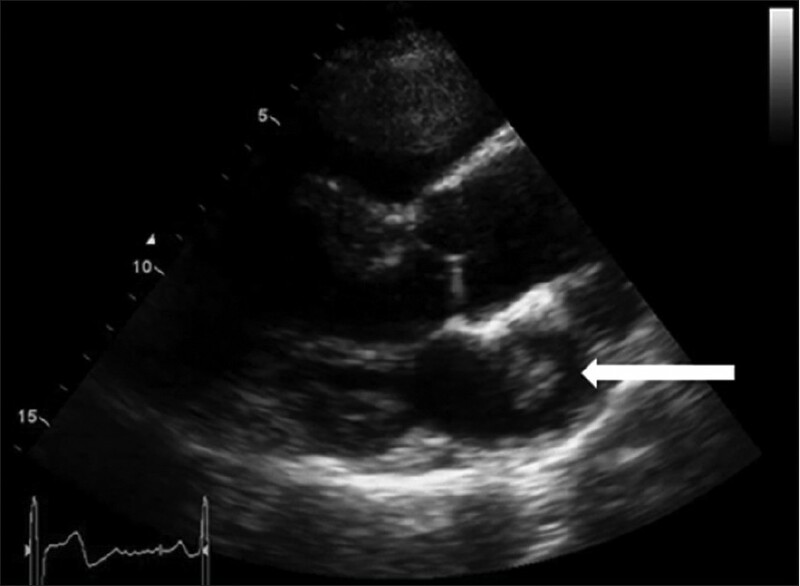 A multicenter study using transthoracic and transesophageal echocardiography. Circulation 1996;91:2785-92. 7. Moorthy SS, Diedorf SF. Significance of atrial septal aneurysm: Report of a case. J Clin Anesth 1996;8:595-7. 8. Messé SR, Silverman IE, Kizer JR, Homma S, Zahn C, Gronseth G, et al. Practice parameter: Recurrent stroke with patent foramen ovale and atrial septal aneurysm: Report of the Quality Standards Subcommittee of the American Academy of Neurology. Neurology 2004;62:1042-50. 9. Hanley PC, Tajik AJ, Hynes JK, Edwards WD, Reeder GS, Hagler DJ, et al. Diagnosis and classification of atrial septal aneurysm by two-dimensional echocardiography: Report of 80 consecutive cases. J Am Coll Cardiol 1985;6:1370-82. 10. Hosoba S, Suzuki T, Asai T, Takashima N. Surgical repair of a giant atrial septal aneurysm with patent foramen ovale. Heart Surg Forum 2011;14:E267-8. 11. Pan M, Suárez de Lezo J, Medina A, Romero M, Segura J, Mesa D. Percutaneous treatment of atrial septal aneurysm. Rev Esp Cardiol 2005;58:222-6.